If we assume, as I do, that an organization is a system, then its functioning is largely dependent upon two core things. First of all we have its efficiency, which can broadly be thought of as doing the things it does in the right way. The second element is its effectiveness, which can be thought of as doing the right things. Now, these two things are important, and it’s important that they’re treated in unison. Quite often we get companies focusing on becoming as efficient or lean as possible, which is great, except the righter you make the wrong thing, the more wrong it becomes. In other words, becoming more efficient in completely the wrong things merely entrenches that behaviour and makes your situation worse. Contrast that with the counter position, ie doing the right thing in the wrong way. That is a situation that can at least be rectified. It’s a situation that a person and an organization can treat as a perfect learning opportunity. Therefore, it’s much better to do the right things in the wrong way than it is the wrong things in the right way. 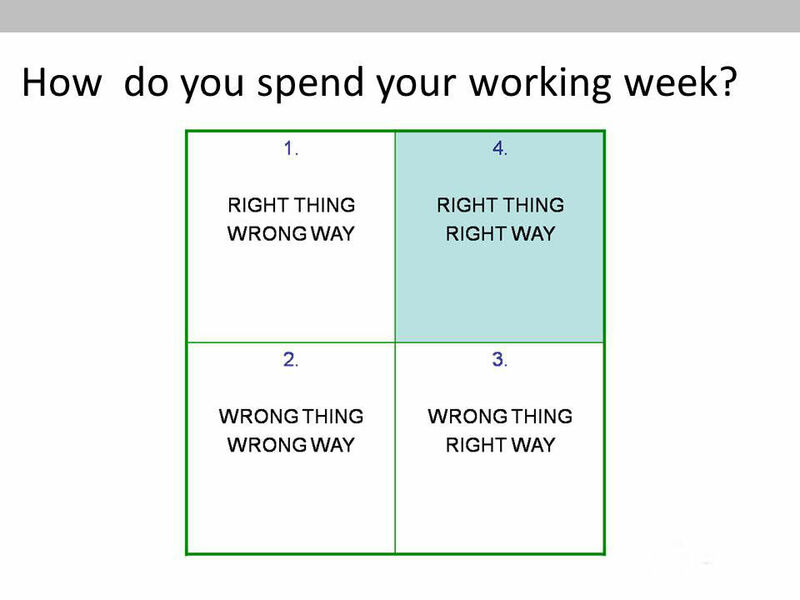 As you can see from the quadrant above, you want to be doing as much as you can in the right hand corner. How do you and your organization do?